Founded by Nichola Adams, ergonomics expert and previous back pain sufferer, Corrigo is dedicated to preventing and reducing postural back pain. We know that when you feel good, you work well and enjoy a life free of pain. Our know-how and expertise in workplace ergonomics means that we know what it takes to help improve your posture and get you back to feeling well and enjoying life again. With the majority of our lives now spent in front of a computer, it is essential to protect your back from the tension and pain build up caused by sitting badly. Corrigo ergonomic office products are different. We are passionate about helping everyone, from those with general postural pain to chronic back pain sufferers and we therefore offer bespoke solutions and expert advise to cater for every individual. Although every Corrigo office chair is a stylish, contemporary piece of office furniture, it will also benefit your health. The fully adjustable design of our products enables you to sit fully supported and in comfort at your desk which provides relief from existing back pain and prevents future back pain. When you correct posture, back pain is reduced. Sitting upright allows you to breathe more efficiently, increasing the brain’s supply of oxygen to keep you alert and more productive. No more slouching. 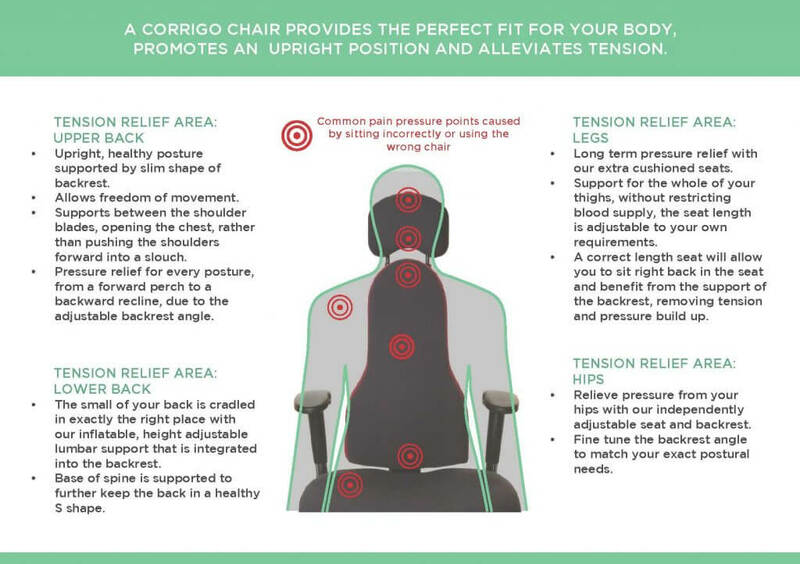 Corrigo ergonomic office chairs are designed to look after your body, relieving back pain and leaving you free to look after your business. After all a mind free of pain is a mind free to think.